Another milestone of the Philippine Stock Market. PH hit the 7000 mark once again. What's the indication? Let's wait and see (I mean, let's act, sow and reap and then we see). 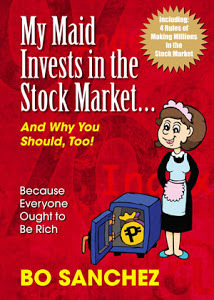 Let me share your this from the Truly Rich Club Stock Market update from Bo Sanchez just this August 2014, please read below..
"Every once in awhile, I need to tell you this. Because some of your relatives and friends may be saying, “Are you crazy? The stock market is a dangerous place to put your money! I lost all my money there!” I need to remind you that you’re not crazy. That you’re actually very intelligent in choosing the stock market as your primary vehicle to wealth. Jeremy Siegel, in his book Stocks for the Long Haul compared the returns of the stock market vs. bonds and Treasury bills. He says that the stock market is still the most profitable place to invest your money. 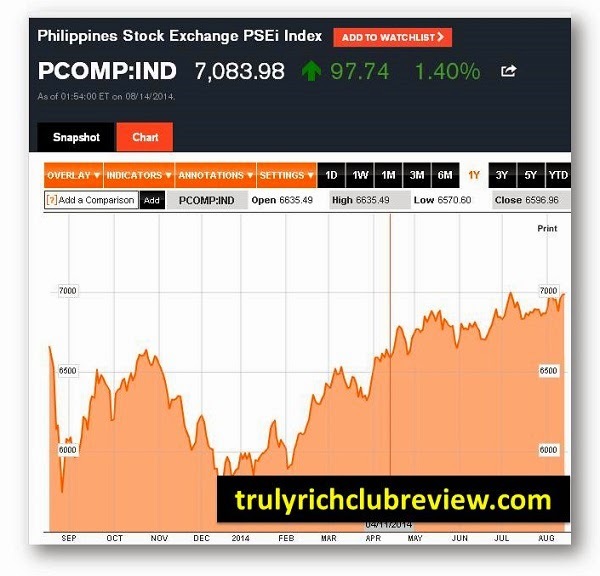 The bellwether Philippine Stock Exchange index surged beyond the 7,000 mark on Thursday morning led by Philippine Long Distance Telephone Co (PLDT) on reports of the telco's increased weighting on the widely tracked MSCI Philippine Index. At the Philippine Stock Exchange, the benchmark index rose 98.46 points, or 1.41 percent, to 7,084.70 at the close of morning trades. All counters were trading in the green led by the services sub-index, which rallied 2.58 percent. Buying was triggered by reports on the MSCI rebalancing set to take effect on August 29, said Gab Aguila, equity analyst at DA Market Securities. "It has to do with the increased weighting of PLDT on the MSCI," said April Lee-Tan, head of research at COL Financial Group Inc, noting that buying momentum spilled over to other stocks. PLDT shares rose 5.12 percent to P3,284 per share at the noon break. Overnight, US stocks returned to positive territory for the year as investors shrugged off flat retail sales in July, below expectations for a 0.2 percent rise. The Dow Jones Industrial Average gained 91.26 points, or 0.55 percent, to 16,651.80, delivering a gain of 0.45 percent for the year. The Standard & Poor 500 index climbed 12.97 points, or 0.67 percent, to 1,946.72.